"Shiro Motoori: class representative. I look forward to working together from here on, though it may be a short partnership..."
If I'm with you, I will not be afraid of anything! I dream of that meeting place. He who is eternal, he who exceeds death. Release! Cosmic Terror! A diligent second year student from Shinjuku Academy who is also the representative of his class. He can be a bit stubborn but he has a wide range of knowledge and is highly intelligent. He loves the occult and is also a childhood friend of Kengo Takabushi. He's an avid reader but does not actually get along with people who rely on book-smarts. A second year student of Shinjuku High School and childhood friend of Kengo. At times he can be strict and inflexible, but he's very intelligent and absorbs information easily. The one red mark on what is otherwise the model honor student is his fascination with the occult. 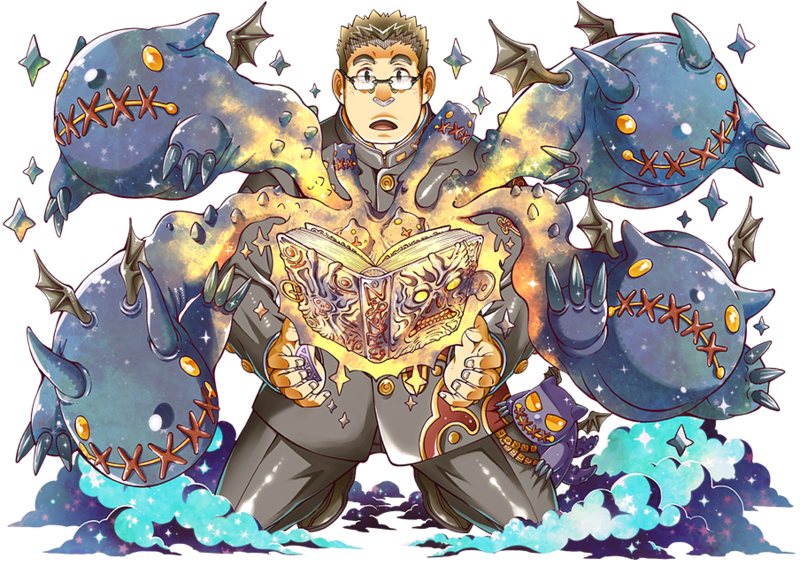 This is the form Shiro takes after unleashing the power of his Book, one of only five Books of Madness in existence. Unleashed along with it is the Rule of Resurrection, which draws the ruler of deep space, and entity best left alone. The price for this transgression is a loss of sanity. 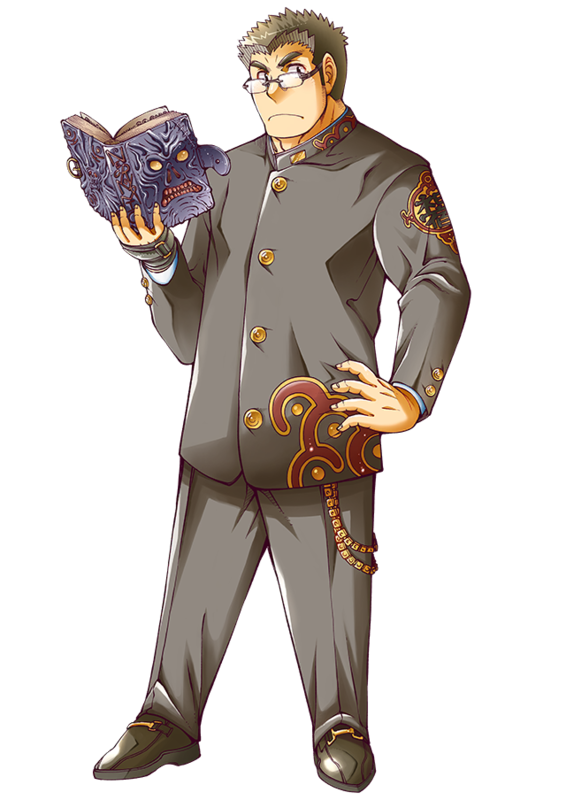 His Sacred Artifact is one of only five of its kind in the world, a magical tome said to drive men to madness, but Shirou's uncontrollable drive to learn more tugs at his mind, inviting the attention of dangerous forces humans weren't meant to meddle with. Ah! W-Welcome back. I'm not sure if this matches my character, but... Today is a very special day. N-No, I just got here. I wasn't waiting at all. I-I really like you, buddy! Such a painful feeling... Overflowing emotions... This is the first time in my life! I can act proactively in events such as this. S-So... Would you like to go back together? I see... I was full of myself... I apologize. One day when he opened up his grimoire, a certain prescription for an offering caught his eye, one that would delight the Evils that serve as his familiars. Deep within, his heart pounded wondering what sacrilegious thing would be made from using unusual ingredients in the cuisine he never heard of, with the mysterious smell coming from the heated saucepan. But in the end, by all appearances he made chocolate. As the Evils happily ate it, his skill with making confectioneries improved before his eyes. Now his skill advanced to the point of being famous around the school area, and the amount of people seeking his chocolates or asking for chocolate making lessons became endless. His full name is Shiro Motoori (本居シロウ). His Role is "Gatekeeper" and his Rule is "Resurrection." Even if he got possessed. Goodbye sassy, I won't miss you at all. Finally the icon looks happier. King of the four-eyed nerds! Shiro is actually such a bizarre character. The story specifically takes time to paint him as an unathletic bookworm characterized by reservations, self-doubt, and a focus on mentality. Thus, he serves as a perfect foil to Kengo, a jock type who is in turn characterized by his confidence, outgoing sincerity and hyper-masculine physicality. The intent couldn't be more simple and up-front narrative-wise, but then we come around to the actual character designs and Shiro is more jacked than half the cast-- almost as much as Kengo himself-- while we're all but told in Ikebukuro that one of the wedges in the relationship between these two characters growing up was that Shiro was always absorbed in books while Kengo was more interested in being active. Even as the story unfolds, Kengo continues to be the only member of the main 3 considered to have any physical prowess. Now this is not to say that nerdy people can't have an interest in working out or be naturally big, but such inclinations are never implied or would even seem in-character for Shiro. 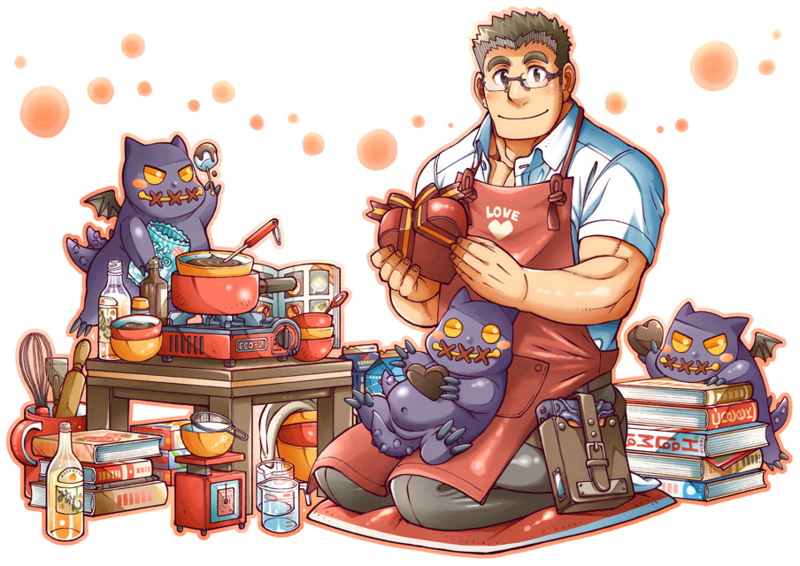 I normally appreciate man candy wherever I can get it (that probably goes unsaid for most Housamo players), but this utter disconnect between Shiro's design and his writing just completely ruined the character for me to the point where it bothers me so much that I refuse to even use him at all despite his power as a formidable support unit in-game. But hey, at least his Valentine version is really cute. I'm happy for the fans who like him. Looking forward to the translation for the next part of the story heavily featuring him nonetheless.